Classic Chrome and Curves Perth offer their 1957 Cadillac Limo Wedding Car for those who want to add a touch of classic nostalgia to any special occasion. This factory Limo is an original 1957 75 Series 8 seater in absolute pristine condition with a white and burgandy leather interior, iPod compatible stereo system, whitewall tyres and more chrome and curves than you will ever see on any other Perth limousine. Able to carry 8 passengers in absolute comfort this Cadillac Limo is a popular choice for brides wishing to travel to the church with the entire bridal party. The wedding photo opportunities available with such a Classic Limo are a wedding photographers dream and are always a talking point for years to come. 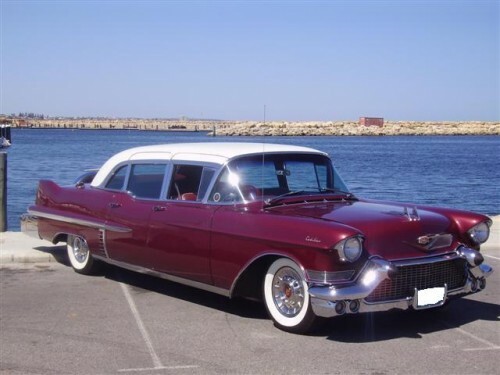 The 1957 Cadillac Limo has also proven a favourite for School Ball hire. For those young adults who have an appreciation of yesteryear classics, the Cadillac Limo is the only way to make that special entrance to their School Ball. Winery and Perth City Tours are also very popular with clients wanting to spend as much time as they can in opulent 1950’s style luxury being chauffeur driven by a professional driver. The classic sound of the Cadillac V8 driving through Perth city streets has proven to be a guaranteed head turner with smiles beaming left right and centre. We could go on but the message is simply that a special occasion deserves a special car and they don’t come much better than a genuine 1957 Cadillac Limo. For all enquiries, inspections, prices and bookings contact Johnny on (0417) 097 112. Ideal for Weddings, School Ball, Promotions, Airport Transfers, Limo Tours, Photo Shoots, Sporting & Concert Transfers, Marriage Proposals, Surprise Party.